Without a doubt, you need to remove burrs from your sheet metal edges. 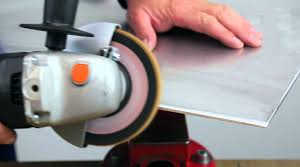 When you have smooth edges on your metal sheets, you’ll be able to manipulate them in a safer manner. By removing the edge burrs we reduce the chance of someone getting hurt. We can remove our sharp edges with a manual deburring tool, but this method is time consuming and costly. On the long run it makes little sense to keep using this since we’ll get inconsistent results. Another common option is to use sand paper disks and fibers on angle grinders. This requires special care from the machine operator so that the dimensions of the work piece don’t get modified, it is also difficult to get a uniform finish throughout the length of our work piece using this kind of manual tools. If you want the edges of your work piece to have a uniform and safe finish for handling, deburring table machines may interest you. This machines are more cost effective than the stationary ones and will ensure the quality and safety you are looking for on the edges of your work pieces.